Many people like to use horse racing betting systems, to find their bets for the day. These can either be mechanical betting systems or adaptive betting systems. A mechanical betting system uses a rigid and strict set of rules, meaning that everyone who uses the system will pick exactly the same horse, every time. An adaptive betting system uses a set of rules that allows each person to use their own judgement in parts and/or read things differently from another user of the same system. Whichever system you prefer to use, what you must have is a set of rules that make sense. a) It is the only horse in the race carrying the top weight. c) It has not won in any of it’s last 6 races. As you can see, the rules here are rigid and allow no deviation by the user. They also make sense as to why a horse that is a selection may have a chance of winning. If you take the first two rules these just point to the races in question but in rule 3 you have the rules that define the selection and with good reason for doing so. Take part a), where the horse must be carrying top weight. Top weights in handicaps have the highest rating given by the Official Handicapper and despite the larger weights they have to carry for this, they do win more races than the second highest weightd horse, from the third highest rated horse and so on. In part b), we want one of the top 3 jockeys at the course riding this horse. This makes sense, as a jockey who has won more races than others riding today will have a better idea of how the course rides, where to place the horse at certain points in the race and more experience overall, therefore must give the horse a better chance than a jockey who has never ridden the course before or has a poor record of wins to runs at the course. Finally in part c), we are betting in handicap races only, so if a horse has not won in its last 6 races, whilst it could be seen to be out of form, the chances are its official handicap mark will have been dropping recently due to not winning and therefore the horse will have a better chance today. Being top weight and not having won in at least 6 races, means it may also have dropped in class today, so will be racing against rivals who have been competing at a lower level. All in all, by combining these three factors together, we have a well structured betting system that will highlight one or two good bets and winners during the week. Making this an adaptive betting system. By allowing the rules to be adapted by each user, the system becomes less mechanical and harder to follow a set of results for. An example would be to say the horse must have won on the going of today’s race or the horse must have won at today’s distance. These days both the going and the distance vary to a major degree at some courses and it is hard to say what the distances are exactly. The 5 furlong race at Bath is actually listed as 5 furlongs and 11 yards, then they also have a 5 furlong and 161 yards race. The first race is clearly not exactly 5 furlongs and the second is nearly 60 yards short of a full 6 furlongs race. So if today’s race is a 6 furlongs race and your possible selection has won before over the so called 6 furlong race at Bath, some would say the horse has won over the distance, whilst others would disagree. After all, 60 yards is nearly a third of a furlong and quite an extra distance for a horse who needs every yard of a 6 furlong race. It can be the same with the going where major differences can occur depending on what paper or website you are looking at. Betting forecast prices can also turn a methodical system into an adaptive one, if the rules say the horse must be forecast at 10/1 or less. Unless an exact source is given for the betting forecast to use, different users will get different selections over time. Whilst neither a mechanical or adaptive system is better, an adaptive system will usually be more complicated than a mechanical one and this brings me on to the next point. Some systems have a lot of rules to go through that must all be applied and some of these would personally prefer to bin it, rather than try to win (with) it! Personally I don’t believe you need a lot of of rules to find a systematic selection, just three or four that are uncomplicated and as I have said before, actually make sense. If you have a massive list of rules to follow, then you give yourself too much room to ‘filter the results’. Too many rules mean you can drill down too much into the system and eventually end up with a system that has an excellent strike rate but gives you just two bets per month! I would say a maximum of 5 rules, all with sound common sense, based on previous winning factors will do just fine and allow you to find your selections for the day within ten to 15 minutes maximum. Proven systems are few and far between and finding one that you can put to use is not easy as most who use profitable ones or who came up with the idea, probably don’t want to share it with anyone else. Trying to think outside the box will help you come up with ideas that others won’t be using. Something different gives you a chance to try out ideas and win from another angle less people know about. The system builder will give you hundreds of different angles when looking for a systematic idea and can make it a very simple process indeed. You can run an idea against any number of form criteria using up to 10 years of past data and most will run through for you in just 1 second or even less. Once you have the basic idea you can then play around with this by changing values such as distances to use, or goings, course names, race class, last time out position and much, much more. Access to the system builder comes with every subscription so this may be something you want to look at. If you are aiming to win at betting on horse racing, it is impossible to make a substantial income, second income or an additional monthly spending amount using just one betting system. You can’t put all of your eggs in one basket, otherwise if this system fails you are left with no profit whatsoever. Betting systems will fluctuate throughout the year as there will be good times and there will be bad. One system may prove better over the flat and another may do better over the jumps, so having a collection of three or four ‘micro systems’ is the best way to aim for a small amount on each system that adds up to a positive total profit at the end of the year. Instead of aiming to win X amount on just the one system, find four systems and aim to win X/4 on each. This way you will also have a far steadier route throughout the seasons without any major dips to your profits. If you do have period of losses and you have no back up systems in place, you may start to panic, chase losses, increase stakes and lose the lot very quickly. So finding a portfolio of systems that suits your betting style, giving you a number of bets each day or each week that you are happy with is a sensible way to start betting to win. I think that the vast majority of people betting today actually do use a betting system, if not to absolutely find a single win or lay bet, but to at least narrow down the field. It makes sense to do this as betting systems do give a structure to your betting and overall this gives a more disciplined approach. Creating your own is not too difficult as long as they are simple enough to run, make sense and have a reason to why they should point you towards your winning bets. Once you find something that works you will be far more inclined to stick to these bets and cut out those fun bets that cost most of us dearly. Experience A Greater Degree of Success! 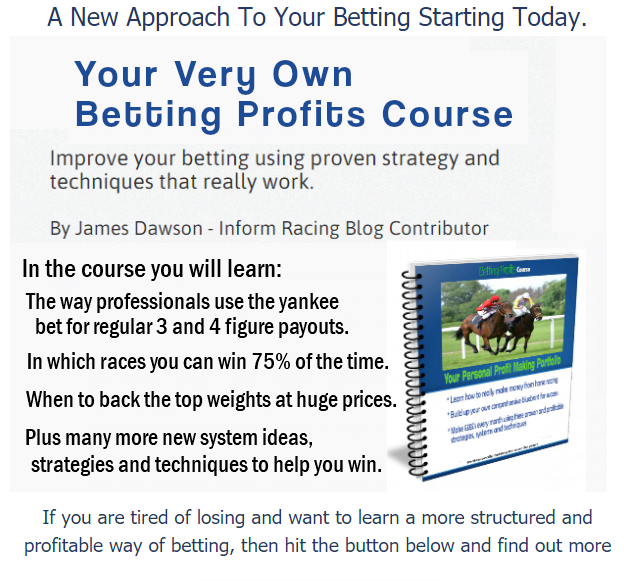 Your Betting Profits Course that covers all angles of racing and betting, straight to your inbox today. All new ideas and new betting strategies, including a simple method you can use that generates a return 99% of the time.